Posted on Sunday, April 30th, 2017 in Democratic Republic of Congo, Interview, Parks, People, Virunga National Park. 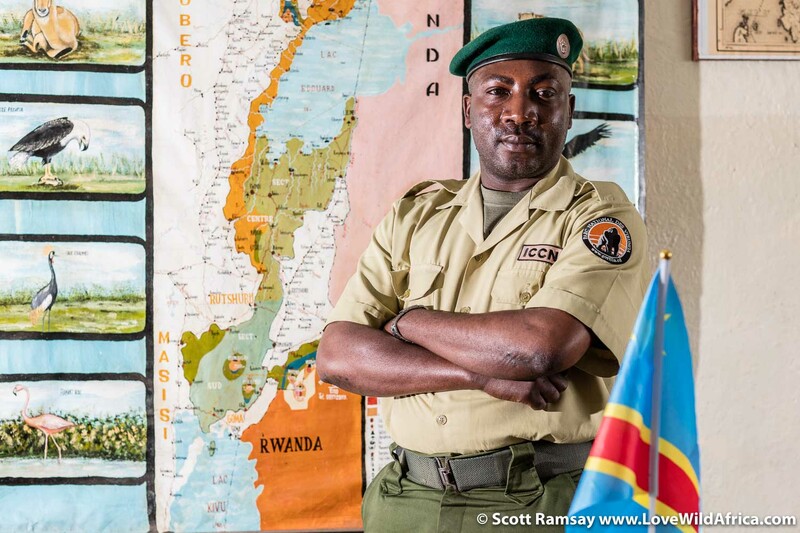 Innocent Mburanumwe, 45, is warden of the southern sector of Virunga National Park, in the east of Democratic Republic of Congo. At 225 square kilometers, the southern sector is the smallest of the park’s three sections. But it’s probably Virunga’s best known area, because it is home to two of Africa’s most remarkable attractions: rare mountain gorillas and the continent’s most active volcanoes. It is also where the park headquarters are based, at Rumangabo. In the west of this southern sector, the lava lakes of two active volcanoes – Nyamuragira and Nyiragongo – are among the biggest active volcanoes in the world. Visitors can hike to the top of the latter on a guided tour. In the east of the sector, on the border of Rwanda and Uganda, visitors can join guided treks to see several groups of gorillas that live in the high rainforest on the sides of five dormant volcanoes. The most popular trek starts at Bukima ranger post and ascends the slopes of Mount Mikeno, which rises 4 400 metres into the sky. Against this backdrop of beauty and biodiversity, Mburanumwe and his team of rangers are fighting a very real battle. There are several thousand armed militia operating in and around the park. Mburanumwe himself has been involved in several battles, and has seen several of his colleagues die. The FDLR (Force Democratiques de Liberation du Rwanda) comprises many of the escaped killers from the 1994 Rwandan genocide, and they control much of the charcoal trade that occurs in the forests. In 2012, the M23 rebel group stormed Rumangabo and the surrounding area. The area was eventually recaptured by government forces. Mburanumwe comes from a family of rangers. Sylvestre (his father), Aniset (his uncle) and Pascal (brother) all worked as rangers for the park. All three have passed away, leaving Innocent to continue the family’s conservation legacy. His brother died in 1996 during the civil war. Tall, polite and appropriately formal for a conservation soldier, Mburanumwe grew up in Rutshuru, 20kms north of Rumangabo, and started at Virunga as a driver in 1998. He soon completed his ranger training and began patrolling the southern sector on foot for weeks at a time. He became warden in 2010. While he is comfortable handling a rifle, interacting with locals and leading his team of rangers, Mburanumwe is probably the park’s foremost expert on mountain gorillas. He saw his first gorilla at the age of 11, while helping his father Sylvester habituate some of the gorillas so they could be visited by tourists. Once he had become a ranger, Mburanumwe was chosen as the leader of the gorilla identification team, responsible for monitoring every single one of the 300 iconic animals that live in Virunga National Park’s forests, a third of the approximately 900 mountain gorillas left on Earth today. Mburanumwe speaks mostly Kinyarwanda, Swahili and French, but his English is clear and concise. I was fortunate to chat to him briefly at his offices in Rumangabo. Scott Ramsay: What was it like to see your first gorilla when you were a young boy? I’ll never forget, because it was a huge silverback. That made me think how they live their lives, because they seemed to be like human beings. I asked my father, “How can this creature with the face of a human stay in the forest?” He just laughed at me, and encouraged me to ask more questions. How many gorillas have you seen in your life so far, and what do they mean to you? I have seen so many that I can’t remember how many. But many, I have seen many gorillas. They mean so much to me and my family. When I was young, my father explained how rare they are and why we have to protect these animals because they’re the last in the world. We have to protect them so that our children can have a chance to see them. Most of all, what made a big impact on me is how the gorillas are probably the kindest animals I have seen. They seem different to all the other animals, and to humans. In 2007, five gorillas in the Rugendo family were shot by poachers in the Mikeno sector. One of them was a female, named Mburanumwe after your family. What was the impact of that on you and your team of rangers? I felt sick. I was shocked. My heart broke. I don’t know how anyone can do that. I don’t know how people can do those things. Did the killings discourage you and your team? No, it made us stronger, and we worked hard to continue our mission of protecting Virunga and the gorillas. In the southern sector, what’s your biggest threat, at the moment? The FDLR is our biggest threat, because they control the charcoal industry. They’re cutting forest trees, and making charcoal, which they sell to local residents, which need the wood for cooking and warmth. The FDLR are very dangerous, but it is our job to stop them making charcoal. When we do this, they are very aggressive to me and my team of rangers. We have lost about 45 rangers in the southern sector since 1994. Are the gorillas safe for now? Yes, now that Mikeno sector is again under our control, the gorillas are safe. How many gorillas are there in Virunga National Park? We have approximately 300, and about 170 of those are habituated to visitors. When I started in 1998, we had a total of about 250 gorillas, so the population has grown. We have done our job. How do the local people here perceive the gorillas? And what programs do the park have to give local people the chance to see them? Yes, lots of local people have never seen a gorilla, but nowadays we bring schoolchildren from local schools to the gorilla orphanage at Senkwekwe, where we tell them the story of the gorillas, why they are there, and why they’re important. We are doing our best to teach and inform the community about gorillas. Have your children seen gorillas? Yes, my three eldest sons and my eldest daughter have all seen gorillas in the wild, and they are very happy to experience these animals. My three youngest daughters have been to Senkwekwe, to see the orphaned gorillas. Is it difficult being a ranger for the park, where there are so many local people living in poverty? Yes, that’s a reality, because we are stopping local people from going inside the forest and cutting trees, we are stopping them from poaching animals which they eat. Some of them are not happy with me, but other people are happy. So it’s not all good, but it’s not all bad either. And things are changing. If I compare to the time when I started working for the park in 1998, now many more people understand the reason for the existence of the park. We are working with the community so they can understand the value of gorillas, and the tourists and money it brings to the park and the people. From the tourist they can have money, and that money goes into the population, into the community and it helps them, certainly. Innocent Mburanumwe in his office at Rumangabo. Virunga National Park lies in the east of Democratic Republic of Congo, on the border of Rwanda and Uganda. Mburanumwe is responsible for the southern sector of the park, where mountain gorillas live on the forested slopes of dormant volcanoes in the Albertine Rift of Africa. 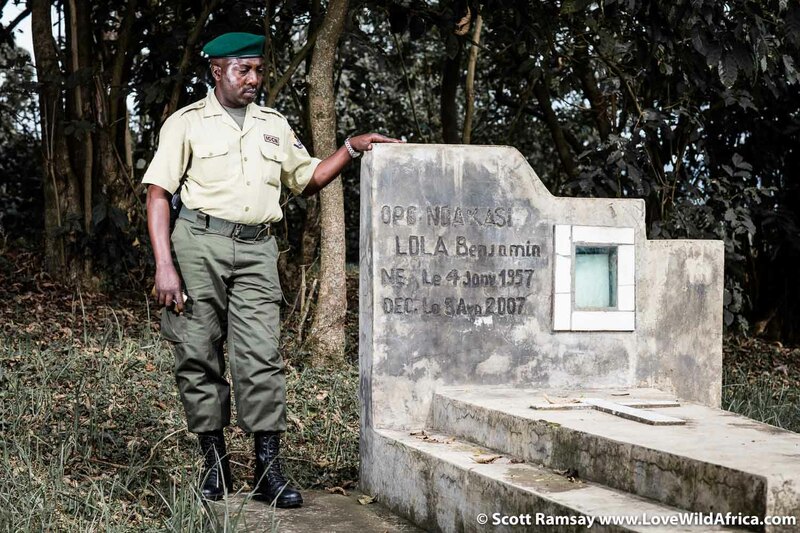 Mburanumwe showed me the grave of Ranger Benjamin Ndakasi Lola, who was the chief gorilla monitor in Virunga for eight years, from 1999 to his death from diabetes in 2007. There is a noticeably proud tradition of conservation in eastern DRC, and Virunga’s rangers are clearly loyal to each other, the park and it’s local people. I felt hugely privileged to spend a bit of time with Mburanumwe. Innocent Mburanumwe, 45, is warden of the southern sector of Virunga National Park, in the east of Democratic Republic of Congo. At 225 square kilometers, the southern sector is the smallest of the park’s three sections.